QTY 12345678910111213141516171819202122232425262728293031323334353637383940414243444546474849505152535455565758596061626364656667686970717273747576777879808182838485 Please select a quantity. Add a modern look to your bedroom decor by featuring this elegant double row nail button headboard frame in your room. Its beautiful linen upholstery and cushioned padding will make your room look like a luxurious and comfortable haven to sleep in. 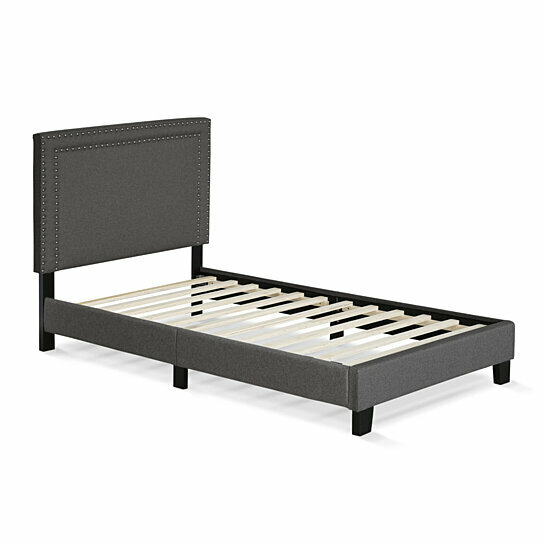 Furinno Angeland Double Row Nail Head Bed Frame comes in multiple size options. This platform bed can be easily assembled with step-by-step assembly instruction. Care instructions: wipe clean with clean damped cloth and this bed will look new for years to come. Avoid using harsh chemicals. Pictures are for illustration purpose. All decor items are not included in this offer. Product dimension: Twin size: 43.13(W) x 45.5(H) x 80.13(D) inches.